You are currently browsing the tag archive for the ‘Michael Katsidis’ tag. I just came across three boxing articles that made me smile. First, I saw that Vitali Klitschko would be defending his WBC title for a fifth time against Shannon Briggs, who in his own right was a two-time champion, but neither reign (if you could even call them that) was all that spectacular. In 1997 he claimed a controversial decision victory against a nearly 50-year-old George Foreman to claim the lineal championship, only to be knocked out by Lennox Lewis in his next fight. Then in 2006 he was losing against Sergei Liakhovich for the WBO championship, but knocked him out with 1 second remaining in the 12th and final round, then turned around to defend his new belt against Sultan Ibragimov who won an easy unanimous decision. Briggs laid out on the canvas, right where Vitali is going to put him. Either way, I figured it would be a tough fight (although a fight he would easily win) for Vitali against a man (Briggs) who can really throw some powerful shots when he is properly motivated and in shape. I’ll be honest here, short of Vitali hurting himself during the fight, there is no way Briggs is going to win this fight, BUT if he could have just kept his mouth shut and let a sleeping giant lie he might have, he just might have had a puncher’s chance. He can forget all that now. Vitali is entirely too smart and has tasted leather from some of the hardest puncher’s of today (i.e. Sam Peter, Lennox Lewis) and Briggs doesn’t have anything on them. I could be wrong, but I do believe that Vitali has never even been down once in his career. 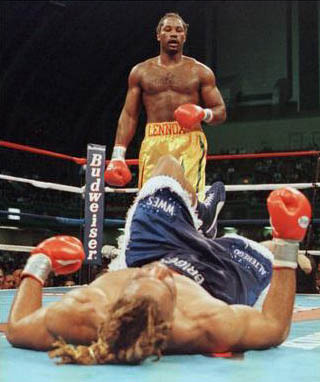 Even in his two losses (Chris Byrd and Lennox Lewis) which are technically down as “KO’s” he never hit the floor. One stoppage was a shoulder injury that Vitali needed surgery (and he was winning the fight by large margins by all three judges) and if Lennox hadn’t opened up the most ghastly cuts in the history of pro boxing, Vitali would have won that fight. Shannon Briggs just shook a sleeping bear. Stupid. And lastly, I read that Golden Boy CEO Richard Schaefer is trying to put a deal together for a title fight between Mexico’s Juan Manuel Marquez and Australia’s Michael Katsidis. This fight has all the makings and potential to be the 2010 fight of the year. HBO gave Shaefer a November 27 date, which Shaefer wasn’t happy about, but what’s he going to do? Put the fight on Telemundo? I don’t think so. So, hopefully, this fight will be finalized and I can sit down and watch a potential Fight of the Year for 2010 and I can be happy.